Steve Smith, intrepid journalist and recent veteran of the European theatre in WWII, quite literally stumbles through winter snow into the biggest story of his life: there are absolutely no maternity ward reservations booked in New York City after June 21. In fact, there are no reservations for maternity wards anywhere in the world after that date. On September 21 of the previous year, there was a disastrous explosion at a nuclear power plant in Mississippi, which nearly leveled the entire state and “was seen as far north as Chicago.” Other than some aftershocks and tremendous heat, there hadn’t seemed to be any lingering side effects — but radiation released from the accident spread around the globe and sterilized nearly every human male, leaving women unscathed. A deeply introverted geologist, Homer Adam, happened to be at the bottom of a Colorado lead mine at the time of the explosion, turning him into a commodity more valuable than uranium or state secrets. Once his fecundity is discovered, the United States government seizes control of him and immediately begins the long, drawn-out process of determining what’s to be done. It’s all about the good of mankind, you see, though if the government were to profit somehow along the way, surely no one could begrudge them that. Mr. Adam becomes an instant celebrity, hounded by Machiavellian senators and blonde bombshells alike, with the entire world clamoring to know how and when he’s going to save mankind from gradual extinction. No pressure, right? Mr. Adam takes place in New York City, the village of Tarrytown, NY, and a few high-dollar locations around Washington, D.C. More important than the locations, however, are the people, all of whom have their own ulterior motives and agendas in mind as they shepherd Mr. Adam around. The National Re-fertilization Project and the National Research Council are having a very polite, memo-laden war over which government organization gets to determine how Mr. Adam will go about his, ahem, fatherly duties. Every possible social group, religion, race, and creed wants preferential treatment for their young women. Steve Smith strikes up a friendship with him, but even Smith is benefiting by his proximity to the most sought-after man in the world, and Homer Adam seems too kind-hearted and naïve to make any determinations on his own. No one is as sharp-elbowed or sharp-tongued as a career journalist who also has decades of experience working with their government, and Mr. Adam is filled with Frank’s humor and insight. Whether he’s skewering pompous Army officers who’ve never seen a day of combat but parade around with a chest covered in medals, bureaucracy-obsessed government officials who can’t get a moment of work done because they’re too busy deciding who’s in charge, or the way men and women interact when procreation is the only thing on their minds, no one is safe from being raked over the coals. There’s plenty of intrigue and double-crossing at play, too, keeping readers guessing Mr. Adam’s fate from one page to the next. Though some outdated ideas are occasionally expressed, particularly with regard to the scientific specifics of nuclear radiation or the depth of baby-fever experienced by some female characters, it’s easy to acknowledge them as relics of the past and set them aside in favor of enjoying Frank’s prose. I’m pleased that, seventy years after its initial publication, Mr. Adam is being made available for a new generation of readers. It’s a warning about the very real dangers of nuclear power, but it’s also a celebration of humanity’s ingenuity and survival instinct. 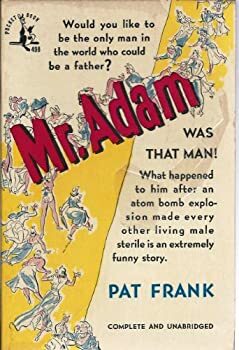 But more than that, Mr. Adam is a well-crafted and compelling story, and I highly recommend reading it or any of Pat Frank’s other classic novels. Originally published in 1946. 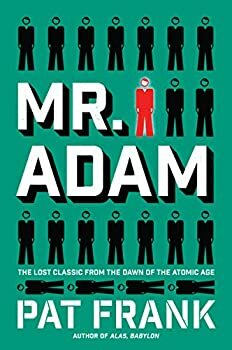 Originally published at the dawn of the Atomic Age, Mr. Adam is a riveting, chilling novel from the author of the post-apocalyptic classic Alas Babylon, revealing the dangers of nuclear power—and the far greater danger of government bureaucracy. A young newspaperman accidentally turns up the biggest story of his career: On a certain date in the not-too-distant future, there are no reservations in the maternity wards of any hospitals in New York. When the journalist’s AP office checks other cities, he discovers that this alarming state of affairs is not just in the United States, but in the entire world. A few months earlier, an accidental explosion in an atomic plant in Mississippi released an unknown form of radiation that turned the Earth’s men sterile—with one notable exception. Mr. Homer Adam, who was at the bottom of a lead mine in Colorado at the moment of the explosion, is the only man unaffected by the atomic rays. Naturally, he is in great demand, and sadly, it’s up to the government to decide what to do with him. One of literature’s first responses to the atomic bomb, Mr. Adam is an artifact of classic science fiction—an equally biting satire and ominous warning to society—that will resonate deeply with readers today as it did when it was first published in 1946. Sounds very interesting!Thanks for the review, Jana. Sounds fascinating! I wonder if Brian Vaughan used this as inspiration for his V: The Last Man series. Hi, as one who attended his University and lives in his realm of Florida I’m loath to admit I’d never read him. Thanks to you, and my brain’s invocation of ‘Alas, Babylon’ (although it credited Faulkner, arghh) I’ve contacted UF’s Archives where his papers are kept, aiming to dramatize for stage/screen ‘Mr. Adam’. Joseph, I’m a UF alumus and also live in FL (Jax). My oldest son (who helped create this website) also graduated from UF and my other two sons are there now. I didn’t know Pat Frank was an alumnus or that he lived in the Jacksonville area. I have some of his books. Now I must read them.